Use the Eagle Claw 730 60° Flipping Jig Hook fits most weedless jig molds. A very heavy jig hook. These hooks precisely fit in Do-It molds requiring the Eagle Claw style 730 or style 410 jig hook. 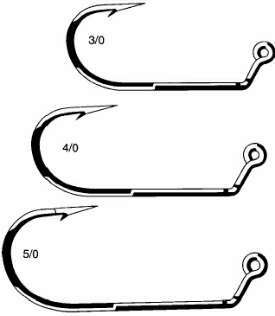 This is a heavy wire 3x hook excellent hooking ability. Designed not to straighten when snagged. Bronze Hook! Use the new Eagle Claw L786 when a premium needle point hook is needed or use the L111 EWG where an Extra Wide Gap hook is called for.